The theme, “Transforming the Public Sector in the Age of Innovation," embodies a resonating drive for a purposive, collective effort of individuals and organizations from APO-member countries to bring transformation in the public sector through innovations that improve productivity. This conference aims to reinforce knowledge sharing and inspire transformations in the public sector on emerging trends, technologies, methodologies, and innovations merged with new policies to impact productivity in the public sector, and how can they be used to enhance the productivity of public sector leaders and organizations based on the contexts of APO-member countries. We invite you to be part of the movement. 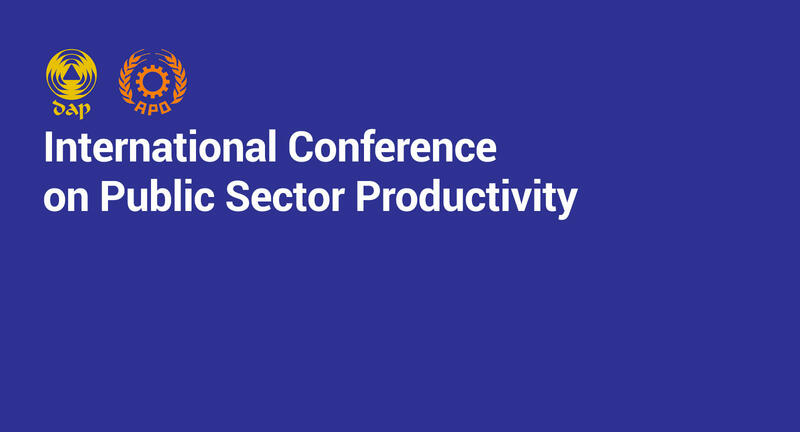 Be one step ahead by taking part in this year's International Conference on Public Sector Productivity. Gather inputs, knowledge and experiences about new technologies, leadership styles and performance management tools for future implementation of the Center of Excellence on Public Sector Productivity. Dr. Santhi Kanoktanaporn is the Secretary General of the Asian Productivity Organization, the premier organization focused on improving productivity across the Asia-Pacific Region. He also served as the Executive Director at the Thailand Productivity Institute. Secretary-General Kanoktanaporn is an industry veteran with over 40 years of hands-on experience in driving productivity enhancement initiatives and strategic international development programs. He also has vast experience ranging from product quality control, to environment and waste management consultancy, to the telecom and petrochemical sectors. Alicia dela Rosa-Bala is currently the Chairperson of the central human resource agency of the Philippine government, the Civil Service Commission (CSC). She also served as the Undersecretary for Policy and Plans of the Department of Social Welfare and Development (DSWD) which she has served for the past 39 years. She was also the Deputy Secretary-General for the ASEAN Socio-Cultural Community Department in Jakarta, Indonesia which covers the sectors of civil service, science and technology, health, women, youth, social welfare and development, disaster management, among others. She was given recognition by ambassadors of member-countries for her contributions to ASEAN at the conclusion of her term. In 2004, she was DSWD’s First Best Manager Awardee, and in 2012 she was awarded Outstanding Career Executive Service Officer by the Career Executive Service Board. Dr. Helen K. Liu is an Assistant Professor in the Department of Politics and Public Administration, University of Hong Kong. She received a Ph.D. in public administration from Indiana University-Bloomington in 2009 and a BA in economics from University of Texas-Austin. Before joining the DPPA, she was an emerging scholar in Urban Institute, Washington D.C., a summer fellow in the RGK Center on Philanthropy, University of Texas in Austin, and a visiting scholar at Peking University. Her primary research interests are in inter-organizational networks, social service provision, collaborative governance, crowdsourcing adaptation, and nonprofit management. Dean Parham is an expert on Australia’s productivity performance. He led the Productivity Commission’s ‘flagship’ program of research on Australia’s productivity performance for over 10 years (until 2008). This research investigated productivity trends and the policy-relevant factors that help and hinder improved productivity performance in the Australian economy. Dean has continued to work in the productivity field since leaving the Commission, with appointments at the Australian Treasury, the University of Adelaide, the Bureau of Resource and Energy Economics and as a Visiting Researcher back at the Productivity Commission. and interested professionals from other institutions. c. promote partnerships and facilitate the integration of policies, plans, programs, and systems towards a holistic perspective, through the conduct of training, education, policy/action-oriented researches, consulting/technical assistance, and publications in good governance and productivity improvement. ﻿In-house accommodation will be available on a first-come, first-served basis. Known as one of the major tourist destinations in the country, Tagaytay City in the province of Cavite has been a go-to place for people from Metro Manila and the CALABARZON region due to its cool climate and best vantage points overlooking the Taal Lake and Volcano. Considered as one of the most elevated cities in the country, the reputable gathering among public sector professionals in this city shall also bring citizen-driven services to greater heights by reinforcing efforts to achieve sustainable productivity. The Development Academy of the Philippines Conference Center (DAPCC) as the venue for the Internal Conference for Public Sector Productivity (ICPSP) in Tagaytay City is befitting the aim to inspire transformation amidst present-day’s fast-changing trends and innovations. The rejuvenated conference center which also features an art gallery and creations by national and contemporary artists signify the Academy’s zeal for stimulating change and creativity among public sector leaders and organizations. With four decades of experience as venue for significant conferences, workshops and seminars, DAPCC is truly a worthy venue for inviting potential professionals who will later achieve national goals and relevant societal change. In-house accommodation are available on a first-come first serve basis. Partner hotel #1 is situated near DAP CC. Visit their website to make a booking. Partner hotel #2 is situated near DAP CC. Visit their website to make a booking. The Development Academy of the Philippines (DAP) is a government-owned and controlled corporation engaged in capacity-building through consulting/technical assistance, training/seminar, professional education, and policy-action research. DAP also serves as the country‘s national productivity organization. Established on 11 May 1961, the Asian Productivity Organization (APO) serves as a regional intergovernmental organization.The APO is nonpolitical, nonprofit, and nondiscriminatory. Its mission is to contribute to the sustainable socioeconomic development of Asia and the Pacific through enhancing productivity. Its vision is to be the leading international organization on productivity enhancement, enabling APO economies to be more productive and competitive by 2020. Established on 11 May 1961, the Asian Productivity Organization (APO) serves as a regional intergovernmental organization. The APO is nonpolitical, nonprofit, and nondiscriminatory. Its mission is to contribute to the sustainable socioeconomic development of Asia and the Pacific through enhancing productivity. Its vision is to be the leading international organization on productivity enhancement, enabling APO economies to be more productive and competitive by 2020.